Many West Michigan Native Americans find culturally-specific treatment at the Nottawaseppi Huron Band of the Potawatomi Health Clinic on State St. NE., where they take advantage of free health and dental care, as well as a community eager to rally around Michigan American Indians with support rooted in a shared cultural perspective. For Anne*, recovering from substance abuse, depression, and a 20-year eating disorder meant seeking help. But having moved around quite a bit as a child, she struggled to find adequate therapy despite decades of battling her issues. Because for Anne, physical, mental, and behavioral health was about more than clinical treatment; it was about working with professionals who understood her culture and her unique perspective. Anne, part of the Ojibwe and Odawa tribes, is a Native American and native Grand Rapidian. One of the approximately 130,000 American Indians in Michigan and part of the 67 percent that live in cities, Anne refers to herself as an "urban Indian," or a Native American that does not live on tribal land. 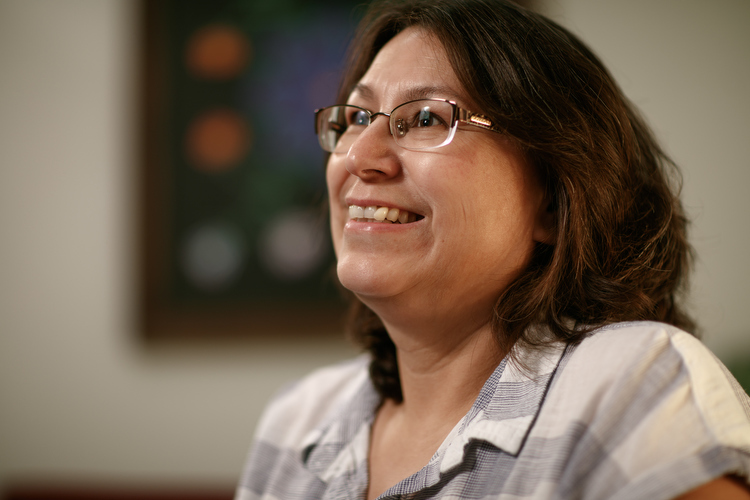 Many West Michigan Native Americans just like Anne — though not receiving healthcare in their home communities or reservations — find culturally-specific treatment at the Nottawaseppi Huron Band of the Potawatomi (NHBP) Northern Facility Health Clinic on State St. NE. Here, patients of all federally recognized American Indian and Alaskan native tribes can take advantage of free health and dental care (no out-of-pocket fees are required, but available insurance may be billed), as well as cultural activities like crafting and drum circles. With a community eager to rally around Michigan American Indians with medical, cultural, and emotional support rooted in a shared cultural perspective, the clinic seeks to tackle historical health disparities for the population, while offering Native Americans who live in cities a chance to reconnect. Dr. Tadd Heft meets with patients who come to the urban clinic. "I've done therapy outside of that clinic before and I have to do a lot more explaining about my background than I do with my therapist here," says Anne, who takes advantage of the NHBP clinic's Access to Recovery program, which provides her with a case manager and therapist. Free to work with others who understand her desire to treat the whole self, Anne says, "I don't have to explain myself that way. And I feel a little bit more freer to share things ... than I do outside of clinic." Anne also participates in a crafting group and a talking circle. "We kind of go over a meditation, we eat, and we participate in traditional crafts," says Anne. "It's been wonderful, I've got connections within the community." All of these things, in addition to the access to regular healthcare, help Anne stay substance-free. "For me, culture is part of that process," she says. When fighting alcoholism, drug use, and depression, "You tend to feel pretty isolated in those things," she adds. "Picking up those pieces of culture that I've kind of dropped along the way…it's really important to me, and it's really helpful, [it] helps me stay sane and balanced," says Anne. Rosalind Johnston"The data is really clear. The health disparities for American Indians are higher than the national average," says NHBP Health and Human Services Director Rosalind Johnston. The 2015 BRFSS Prevalence & Trends Data by the Centers for Disease Control and Prevention, National Center for Chronic Disease Prevention and Health Promotion, and the Division of Population Health shows that Native Americans are more likely than any other racial group to practice binge drinking or to have been told they have diabetes, arthritis, or depression. Native Americans are also more likely to be smokers (42.4 percent versus 11.3 percent of Asians, 25.1 percent of African Americans, and 19.7 percent of whites). These statistics inspire Johnston and the NHBP to double down on their healthcare offerings that focus on holistic care. Based on the Pine Creek Indian Reservation in Fulton, MI, the federally recognized American Indian tribal government funds healthcare at three facilities in Fulton, Battle Creek, and Grand Rapids. Most interestingly, Native Americans were also the most likely to positively respond that they had any type of healthcare coverage (93.9 percent versus 87 percent for Asians, 87.2 percent of African Americans, and 85.8 percent for whites). "What we want to do is create an environment that is culturally appropriate that they feel like this is theirs ... like these services are theirs," adds Johnston. 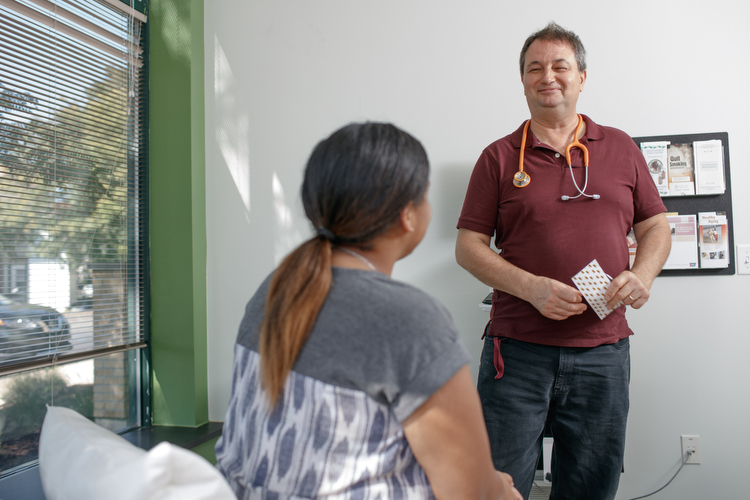 Spending their time and resources to treat the whole person, these health clinics offer a wide range of services — everything from general checkups and dental care, to substance abuse treatment and disease prevention and community health. "I think that's why they come in," says Johnston. They know there is a host of different services….not a 10-minute appointment with a primary care provider … they can take 30 minutes with that primary care provider." With this closed network — somewhat of a one-stop shop for medical, mental, and emotional health — patients are able to access timely and focused care. Eric Williams of the Nottawaseppi Huron Band of Potawatomi is part of a family that has lived in Grand Rapids for generations. 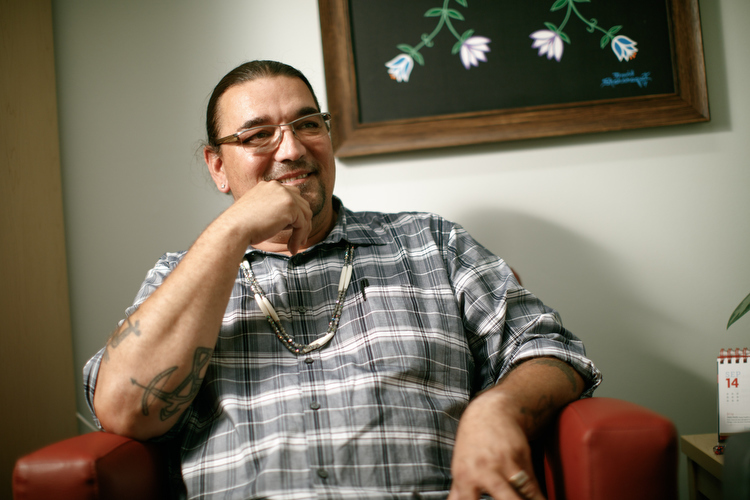 Despite this long history, he still sometimes feels the stigma of being a native in the city. "In native communities, some people joke about urban Indians because we don't have those skills that natives from the reservations have, we lose a lot of those traditional teachings," says Williams. "Having access to the clinic has helped me reconnect to what it means to be native, it has helped me strengthen ties to my tribe and other tribes, helped me learn new skills like crafting or regalia assembly, it's helping me learn my language. Having access to dental and medical in itself is amazing, the fact that I can get quality care without going bankrupt in today's world is a huge thing. Our language changes the way you think, [and] it binds us to our ancestors and other natives." For Williams, part of this culturally-specific treatment is the shared experience of hundreds of years of displacement of, war against, and assimilation of Native Americans across the country. A central part of this history was the practice of forced enrollment of native children in American boarding schools. Michigan was home to a few of these schools, with one of the most notable — the Mount Pleasant Indian Industrial Boarding School — which finally closed its doors in 2008. "Having counselors that understand a native point of view, that understand generational trauma, cultural competency, and sensitivity to issues that affect us is amazing. I think the world tends to forget we (natives) are here, we get asked questions that are really rude like 'how much Indian are you?' … it makes it difficult sometimes. Having this clinic gives us support in every way we need, health is just more then blood pressures and heart rates, this clinic heals us in every way," adds Williams. Culturally aware councilors like Jonathan Rinehart work with urban members of the Native community. With patients from 15 different tribes from across the state of Michigan coming through the doors of the clinic on a daily basis, the health services department at the NHBP hums along at a quick but intentional pace. With 40 total staff in the department and 20 healthcare workers at the Grand rapids clinic alone, NHBP employs physicians, nurse practitioners, physician's assistants, licensed therapists, health educators, dentists, and are currently recruiting dietitians, many of whom are American Indians themselves. For those staff who aren't, "We try to provide significant cross cultural training so that they understand the environment in which we work in," says Johnston. And "This is certainly a busy clinic," she adds. "Once we opened the door to dental, we had a flood gate of folks coming in for dental services." With primary concerns like diabetes, substance abuse, and mental health, the clinic utilizes its roots in Native American culture to determine the best treatment. And though treating addiction is a vital service at the clinic, "The opiate problem isn't as bad for our tribe as it is for other communities," says Tribal Council Chairperson Jamie Stuck. "We've been fortunate enough not to have that problem, but it's a problem in native country all across the state, and it's getting out of hand." (The CDC and National Center for Injury and Prevention Control in 2016 notes the that the unintentional death rate including those by narcotics per 100,000 Native Americans in Michigan was 38.71, versus 21.04 for African Americans and 21.06 for whites). But many of the concerns treated at the clinic aren't physical at all, but generational. "We're still dealing with historical trauma, colonialism, poverty," says Johnston. And these sensitive issues, along with the physical ones, are treated in partnership with each patient in an effort to move away from methods of traditional Western medicine. For Kristy Shananaquet, the NHBP clinic has been a central part of her recovery. Born in Grand Rapids but a member of the Grand Traverse Band of Ottawa and Chippewa Indians in Peshawbestown, Shananaquet sought treatment at the clinic after a recent divorce. Taking advantage of medical and dental services, as well as case management and sobriety meetings, Shananaquet notes, "I don't know where I would be in my recovery [without their services] ... We all work together. We're a team." "There's so many services for the native people," says Shananaquet, also adding that she participates in the clinic's regular drum circle. For her, the combination of medical health treatment, cultural understanding, and a sense of community, helps her pick up the pieces and move forward in a safe environment. "That impact of bringing us all together as a people goes beyond the doors of that clinic," says Shananaquet. Though members of many different tribes seek out a variety of diverse treatments at the NHBP clinic, they share a unified voice in the culture of the American Indian. Overcoming racism, colonialism, and forced assimilation, these generations of Native Michiganders find in the clinic a place of understanding and healing. "There is no other urban center like this on this side of the state," says Johnston, who makes it her mission to form partnerships and allocate resources that promote healthcare for the whole body, and the whole person. "[It's important] to be able to have access to people who are working together to support you and your good health," she says. "That's what we strive for." Photos by Adam Bird of Bird + Bird Photo. Centers for Disease Control and Prevention, National Center for Injury Prevention and Control. WISQARS (Web-based Injury Statistics Query and Reporting System) [online]. 2017. [accessed Sep 26, 2018]. Centers for Disease Control and Prevention, National Center for Chronic Disease Prevention and Health Promotion, Division of Population Health. BRFSS Prevalence & Trends Data [online]. 2015. [accessed Sep 26, 2018].